How Do I Find My Favorite Dentist? Determine what type of dentist you need: If you have children, be on the lookout for a family or pediatric dentist. Having trouble with your gums? Find a periodontist, which is a dentist that specializes in gum treatments. Different dentists have different specialties so outlining you and your family’s personal needs will help you decide. Look at online reviews and family recommendations: Reviews can be a quick and easy way to see if your dentist of choice is providing quality care and what sort of customer experiences people have had. Also, listen to your family and friends. A personal reference can sometimes be all you need in picking out your next dentist. Visit the office: See how you like your potential dentist’s office and speak with the team in perosn. If you notice any red flags or things you don’t like, repeat these tips to find your superstar dentist. Flexible scheduling and office hours: If your job or family life makes it so you can’t see the dentist in the normal 8 a.m. to 5 p.m. window, look for dentists that have shifted or extra hours. Short waiting time: Good dentists will try to be as punctual as they can. Long wait times can indicate lack of organization. Clean office space: Can you imagine walking into a dirty dentist’s office? If their office isn’t clean, how do you know they can clean your teeth properly? Make sure your office of choice is clean and organized to increase the likelihood of a successful dental visit. Gets to know patients: Make sure your dentist actively listens to what you have to say. If they remember things you tell them about your personal life and genuinely care, they are more likely to pay closer attention to detail and provide great service. Happy to answer questions: Go to your appointment with a list of questions and see how your dentist responds. If they take your questions seriously, listen, and provide solid answers, you may have found your next dentist! 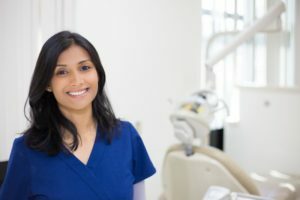 Next time you start your search for a new dentist, keep the factors and qualities we have outlined in mind because they could save you a lot of time and money. Dr. Sarah Esparza is committed to helping the families of Virginia Beach with all their dental needs. She believes in getting to know her patients to provide the best care possible. She currently practices at Esparza Family Dentistry and can be contacted by phone at (757) 499-4707.